The traditional cakes have been done so many times in the past that some brides and grooms are getting creative in their cake choices. Cupcakes have become a fun way to offer individual cakes to guests, and modern cakes have gained popularity as well. However, one type of cake may just take the cake: cheesecake wedding cakes. This newest breed of culinary wedding celebration offers a surprisingly vast array of options. Traditional flavors include chocolate, rasberry, strawberry or plain, but if you prefer a non-traditional flavor, bakers can often present you with anything you desire. Additionally, guests with food allergies or sensitivities may be able to eat cheescake as opposed to flour-based cakes. For example, an aunt with a gluten allergy may be able to partake in the cheesecake wedding cake. 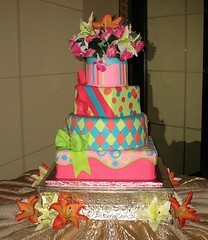 Check with the baker to make sure that your desired cake is perfect for you and all of your guests. While you're checking with your baker on that, you may wish to ask about the wedding anniversary cake. Cheesecakes don't freeze well, and they certainly don't keep for a year. So on the one year anniversary of your wedding, many bakers offer a free small cheesecake for you and your spouse to share in celebration and rememberence of the big day. If your wedding dream does not include a traditional cake, you or guests have allergies, or you just don't enjoy the flavor, a cheesecake wedding cake might be just the option you're looking for. Vituperative enjoys writing about wedding cakes, and he loves to share new trends, like the new cheesecake wedding cakes.